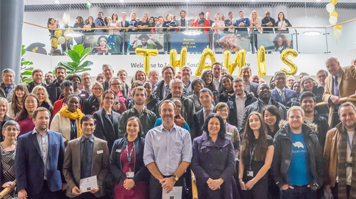 A celebratory event held in London South Bank University’s (LSBU) Keyworth Centre brought together over 150 people, including local partners, LSBU’s tenant community and participants from LSBU’s start-up and business support schemes to share their stories of enterprise, in light of LSBU being named Entrepreneurial University of the Year at the 2016 Times Higher Education Awards. LSBU School of Business postgraduate student and founder of 3p Translation Martina Eco joined Hazel Eki-Aggrey-Orleans, founder of Eki Orleans and an Investment Escalator participant, in a panel discussion featuring an audience Q&A. They spoke about their different business backgrounds and the inspiration behind starting their own businesses. Both outlined the support they had received from LSBU and the difference this had made when overcoming failure and taking their start-ups to the next level. Guests enjoyed champagne and canapés before leaving with an individual cake made by LSBU’s enterprising students in the National Bakery School. Watch our video to find out more about LSBU’s entrepreneurial and enterprise activities.